This high-quality soft, durable nylon pouch is large enough to accomodate many types of headgear, facebows, and other large removable dental appliances. Sturdy plastic YKK zipper with metal pull. Measures 9.5" x 6.25". Machine washable. Available in a variety of colors. 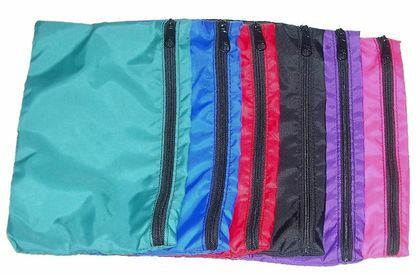 Made of durable Nylon with a plastic zipper. If you wear headgear that is removable, you'll like this high-quality nylon zipper bag. But it can be used for other purposes, as well, such as a bag for a basic dental kit.